PowerShell is a really powerful tool to know how to use. It's invaluable as a SharePoint Administrator, or as a SharePoint Developer. 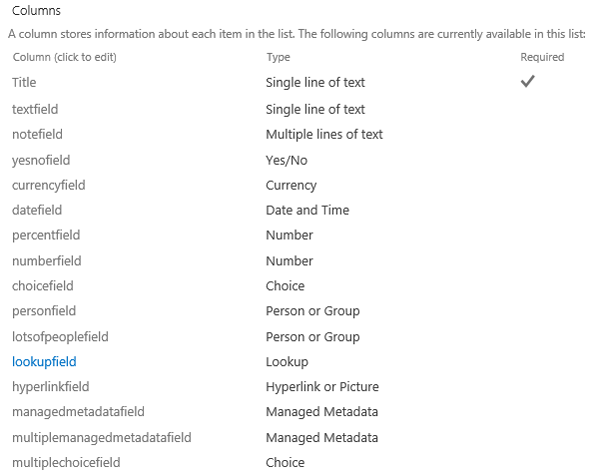 This article demonstrates how to set and get the various SPField types for a SharePoint list. The example below gets the list and displays all the user created fields. This is the basic PowerShell for creating a new list item. This is the basic PowerShell for getting the first item in the list. The type of a Number field is a Double. When you get the number from the field, you can use standard numeric format specifies to format the number for display. See Double.ToString for more information. A currency field uses the same SharePoint field type as Number (SPFieldNumber). The type of a Number field is a Double. When you get the number from the field, you can use standard numeric format specifies to format the number for display, specifically, formatting it as a currency. See Double.ToString for more information. A percentage field uses the same SharePoint field type as Number (SPFieldNumber). The type of a Number field is a Double. When you get the number from the field, you can use standard numeric format specifies to format the number for display, specifically, formatting it as a percentage. See Double.ToString for more information. To set a date field, use a System.DateTime object to create a date, then assign the DateTime object to the list item's field. When you retrieve the value of a DateTime field, you can use standard date format specifiers to format the output of the value. See DateTime.ToString for more information. Calculated fields work in a different manner to that of normal fields. A formula is set on the list field, and when a list item is added or updated, the value of the column for that list item is calculated based on the formula. Get a reference to the calculated field. Then get a reference to the list item. Finally, call the GetFieldValueAsText method, passing in the value of the item objects calculated field. The value of a calculated field is calculated at the time a list item is created or updated. It is not possible to directly set this value. You can use the following methods to set the formula though, which is used to calculate the fields value. Before looking at these methods, there are four main properties that can be set on a calculated field; Formula, OutputType, DisplayFormat and DateFormat. Which properties you need to set, depends on the value of the calculation. Formula: The formula used to calculate the value. OutputType: The type of the value that results from the calculation. Supported types are, Text, Number, Integer, Currency, Boolean and DateTime. DateFormat: Used with DateTime to specify Date, or Date and Time.